Jason Wood’s debut race in 750MC Classic Stock Hatch came at the Snetterton 300 circuit on 24th September 2016 taking 17th from 25 starters. 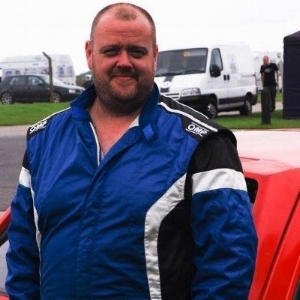 After an exploratory debut race in 2016, Jason Wood committed to a full season racing in the 750MC Classic Stock Hatch Championship, with sights set on the Highest Place Novice award and “Best Prepared Car” after an extensive winter rebuild. Gaining speed with every race, he formed a friendly rivalry for the Novice Class with Jason Watkinson. The pair were near inseparable on track, even trading paint on occasion! Eventually *our* Jason prevailed after a string of class wins and strong overall finishes, taking career-Best 14th places at Silversone circuit and following it with 12th place finishes at rockingham circuit. Along the way, he also guested in the BRSCC Toyo Tires Porsche Championship in the 924 Class, joining team mates Gavin Johnson and Pip Hammond. Although he took an impressive Best finish of 5th at Cadwell Park, his most eye-catching performance following at Anglesey circuit, leading a race for the first time in the challenging Welsh rain. He then represented the Porsche team alone in “The Great Club Autosport 924 Race” driving Gavin’s car and taking impressive 11th and 12th places among a bumper field. Jason was fundamental to the team’s success in 2017, having rewired both Porsche’s and diving in to the repairs on both of the team’s major accidents, as well as hosting the majority of garage work. As a driver with the skills to build and repair too, Jason will only go faster in 2018! Jason campaigns a full season in Classic Stock Hatch in 2018 seeking to break into the mega competitive top ten.